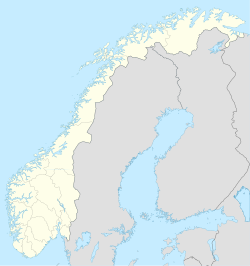 Sigerfjord is a village in Sortland Municipality in Nordland county, Norway. The village is located on the island of Hinnøya by the entrance to the Sigerfjorden. The village of Strand and the Sortland Bridge are located about 6 kilometres (3.7 mi) to the north. Sigerfjord Church is located in this village. The 0.76-square-kilometre (190-acre) village has a population (2018) of 789 which gives the village a population density of 1,038 inhabitants per square kilometre (2,690/sq mi). ^ "Sigerfjord, Sortland (Nordland)". yr.no. Retrieved 2018-12-31. ^ Store norske leksikon. "Sigerfjord" (in Norwegian). Retrieved 2012-07-29.